Do you remember that from Sesame Street? Fun, just like the quilt I am going to show you. Late last year, my friend Stephanie and I agreed to do a swap. Finally, we were able to actually swap!! But most of that was due to my not being able to get my act together. You know the drill, deadlines kept creeping in and they took precedence. 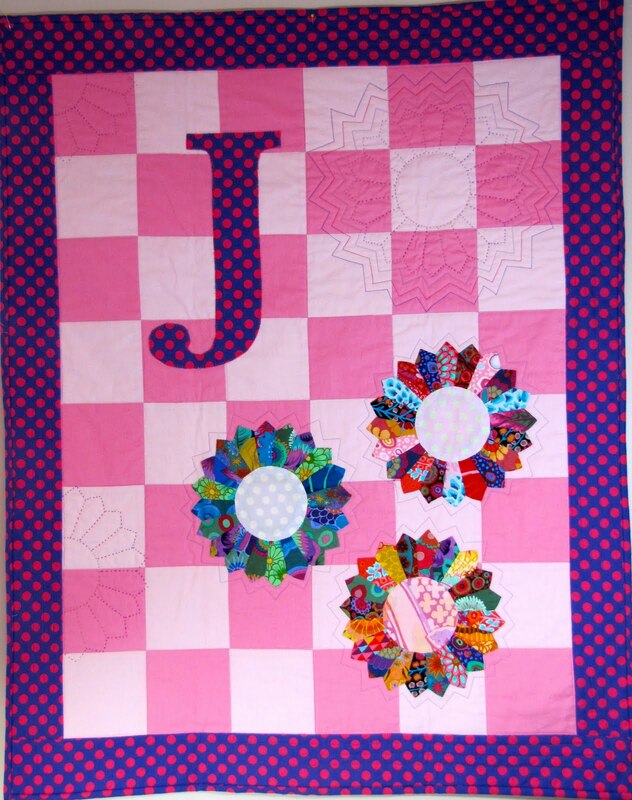 Last week Stephanie sent me the quilt she made for me and I sent her the quilt I made for her. 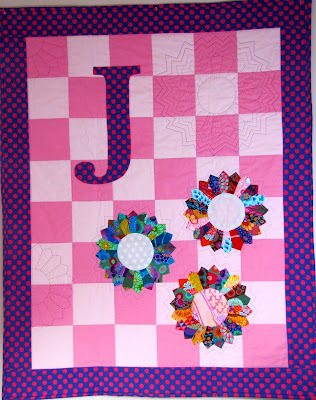 Today's post is just about the quilt she made for me. Let me start by saying... I LOVE it! She made it very personal with the letter J. I am assuming it stands for Jackie and not "Just in time"... LOL! Look at the wonderful quilting. Dresdens something that Stephanie is very fond of, as am I. Three mini dresdens made from Kaffe Fassett fabrics. She knows I love them and they are placed on wonderful pink fabrics, my favorite color... how did you know, Stephanie? This is the back of the quilt another cute dresden on more pink fabric. And what do I spy, her little stamp... cotton twill tape with her business name Loft Creations. Here is the entire quilt... I am in LOVE! It hangs right over my sewing area, just perfect!! Thank you again, Stephanie, I so enjoyed doing this swap with you! 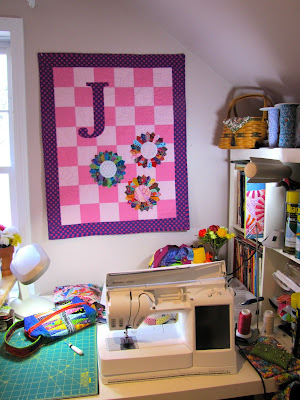 If you like Stephanie's work, you can find her patterns by clicking here and here. Also, don't forget ALL batiks are marked down to $7.50 per yard through April 1. See them all by clicking here.